The overall annual growth rate for international visitors into 40 Asia Pacific destinations is estimated to have been around 7.8 percent in 2018, generating an inbound volume of around 688 million for the year – almost 50 million more foreign arrivals than in 2017. According to the Executive Summary of the Pacific Asia Travel Association (PATA) ‘Asia Pacific Visitor Forecasts 2019-2023’, 40 destinations within Asia Pacific collectively are predicted to show an average growth rate of 5.5 percent per annum between 2018 and 2023, to host close to 900 million foreign visitor arrivals in 2023. Asia is expecting an annual average growth rate for foreign visitor arrivals of 6.2 percent between 2018 and 2023, ahead of the Pacific and the Americas with respective average growth rates of 4.4 percent and 3.1 percent per year. Asia is due to receive the bulk of the foreign arrivals between 2018 and 2023. After capturing a relative share of close to 74 percent of foreign arrivals in 2018, the proportion into Asia is expected to increase to over 76 percent by 2023. 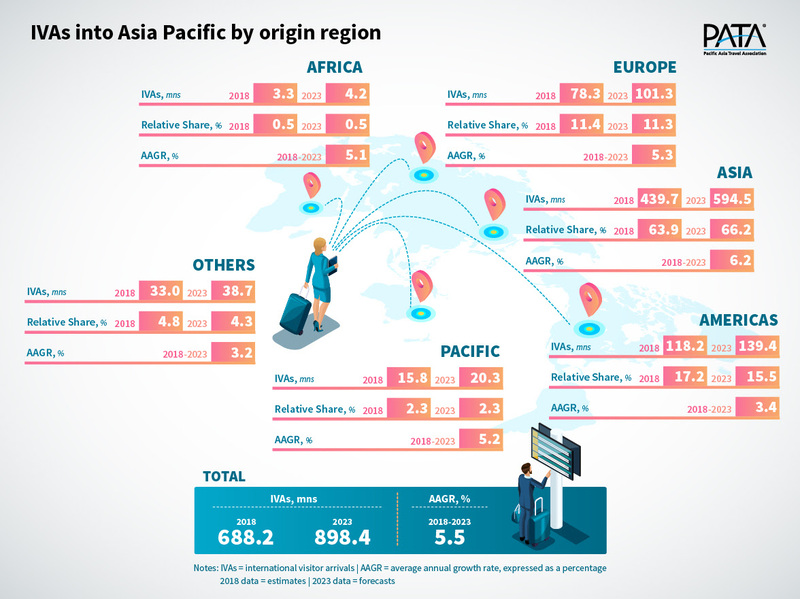 Asia will also be the strongest generator of foreign arrivals into Asia Pacific over the forecast period, improving its relative share of arrivals from 63.9 percentage points in 2018, to over 66 percentage points in 2023. Go-Jek will give more robust competition to Grab in Indonesia. Locally created, Go-Jek recently received new founding to help financing its expansion. Among its new circle of investors are Alphabet Inc’s Google, Chinese e-commerce giant JD.com Inc and China-based conglomerate Tencent Holdings, Mitsubishi Corp and Provident Capital who put funds estimated at US$1 billion. The money will help Go-Jek penetrate the market in Indonesia and strengthen its position in other countries, including Singapore, Vietnam and Thailand, according to a company’s statement. Go-Jek and its affiliates now operate in five countries in 204 cities and regencies across Southeast Asia, with a network of over two million driver partners and 400,000 merchants. After Indonesia, Vietnam has been one of the strongest market for the ride hailing company as Go-Viet gained an estimated 40 per cent of the country’s two-wheeled transportation market share since launched in August last year. Lao Airlines dreams of attracting more Chinese travellers. Laos national carrier management expects to transport this year around 241,000 Chinese customers, a jump of 42% over 2017 and 80% more than in 2017, when the airline carriers 145,000 Chinese travellers. “We are expecting a significant increase this year because Laos’ tourist attractions are becoming more well-known and there are more activities of interest to tourists. These are being promoted by the government and private sectors as well as our airline for Visit Laos-China Year,” explained to the Vientiane Times, Noudeng Chanthaphasouk, Director Commercial Lao Airlines. Lao Airlines offers already more flights to China than to any other airline in Lao PDR with 21 frequencies per week to Kunming with seven flights, Chengdu and Guangzhou with three weekly flights each, Changsha and Jinghong with two flights per week and one weekly service to Changzhou, Shanghai and Wenzhou from Vientiane. There is also a weekly service from Luang Prabang to Changsha. The carrier plans to increase the number of flights from Vientiane to Shanghai to four weekly flights for the coming summer season. Kuala Lumpur will welcome from March 11 to 14 the 8th World Summit on Arts and Culture. The event is organized by the International Federation of Arts Councils and Culture Agencies (IFACCA), a global network of arts councils and ministries of culture, with member institutions in over 70 countries. The event brings together leading policy makers, researchers, managers and practitioners from the arts and culture sector from around the world, to discuss issues of public support for the arts, culture and creativity. Each World Summit is held triennially and is delivered in partnership with one of our National Member institutions. The event is co-hosted by the National Department for Culture and Arts (JKKN) and Malaysia Ministry of Tourism, Arts and Culture. The theme is “Mobile Minds: Culture, Knowledge and Change” and is looking at the profound transformation in culture perception due to globalisation, technology, climate change, and migration. All these issues reshape societies, create complex challenges and invite new solutions. Connectivity creates interdependencies and increased contact between individuals with different values, worldviews, knowledge, and cultural expressions; these in turn can challenge existing power relations and bring unequal outcomes. In the face of such change, existing local and global systems can seem neither fit for purpose nor sustainable. Delegates at the Summit will examine how governments, cultural organisations, creative practitioners, and citizens can – and do – work together to actively lead change. The programme will explore how actors from across the cultural ecosystem and beyond converge or diverge in their response to change in culture perception. Philippines State Secretary for Tourism Bernadette Romulo-Puyat confirmed the excellent performance of Philippines tourism in 2018. 7,127,168 foreigners visited the Philippines last year, up 7.65 percent from the 6,620,908 arrivals in 2017. “This is a time that celebrates the 7.1 million tourist arrival count, the highest ever in our country’s history,” Puyat declared in a statement, adding that this result was achieved despite the six-month closure of Boracay Island, the country’s flagship destination, and the change of leadership in the Department of Tourism (DOT) last year. South Korea remained the country’s top source of tourists with 1,587,959 arrivals while China was a most improved market, growing by 29.62 percent at 1,255,258 arrivals. China was followed by the United States with 1,034,396 arrivals. The State Secretary indicated that the Philippines was growing over the Asian average of 6% last year, citing data from the World Tourism Organization’s World Tourism Barometer. The Department of Tourism (DOT) is aiming now to attract 8.2 million foreign tourist arrivals for the country in 2019 according to Bernadette Romulo-Puyat. This would represent a 15 percent increase over total tourist arrivals recorded in 2018. Thai AirAsia X will launch its first flights to Australia. The long-haul low cost carrier has until today flown only to Northeast Asia, serving Japan and Korea. The latest addition to TAA X network was at the end of October a daily service between Bangkok Don Mueang and Osaka. The opening of a Bangkok-Brisbane flight shows a shift in strategy, TAA X looking also to jump into the gap left by Thai Airways international, which has sharply reduced its services to Australia. Thai AirAsia X will start operating to Queensland with four weekly services from June 2019, using an Airbus A330-300 with 12 premium seats and 365 economy seats.